The term onboarding comes from the HR department. It was originally used to refer to new hires and having them “acquire the necessary knowledge, skills, and behaviors to become effective organizational members and insiders.” If you replace the aspect of new hires with new users the idea is exactly the same. Think of it as part of the whole signing up user journey. Onboarding is part of the funnel and it’s part of the user’s first experience with you app. 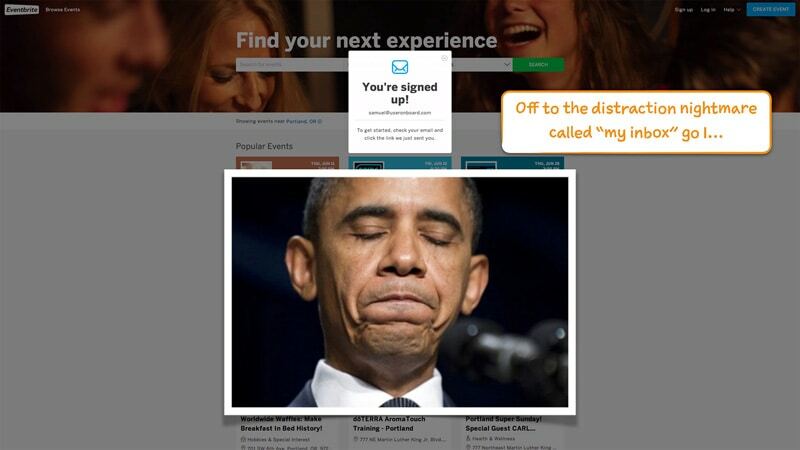 Onboarding experiences can be good or bad. However, I’ve found that app which see onboarding holistically within the whole picture – from getting the user to click the sign up CTA to the user using the product – have the best of experiences. What does the user need? 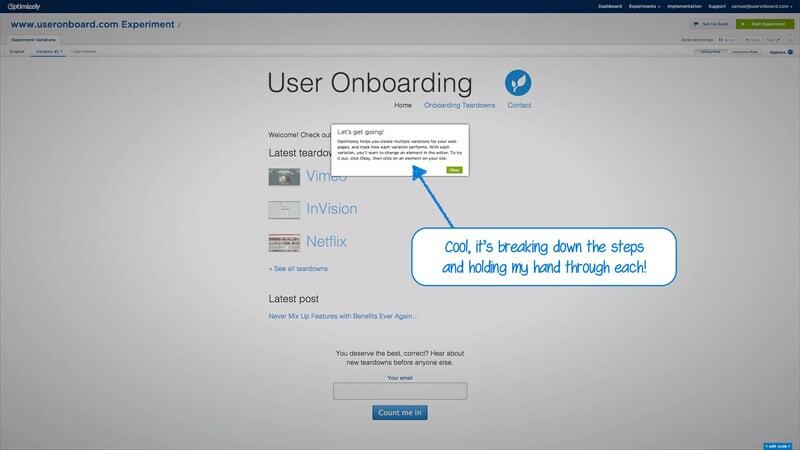 Let’s starts with the purpose of creating the onboarding experience. What does the user need? What kind of information do they need to acquire in order to be successful with using your product? Do they even need an account in order to use your product? If not that affects how the user. 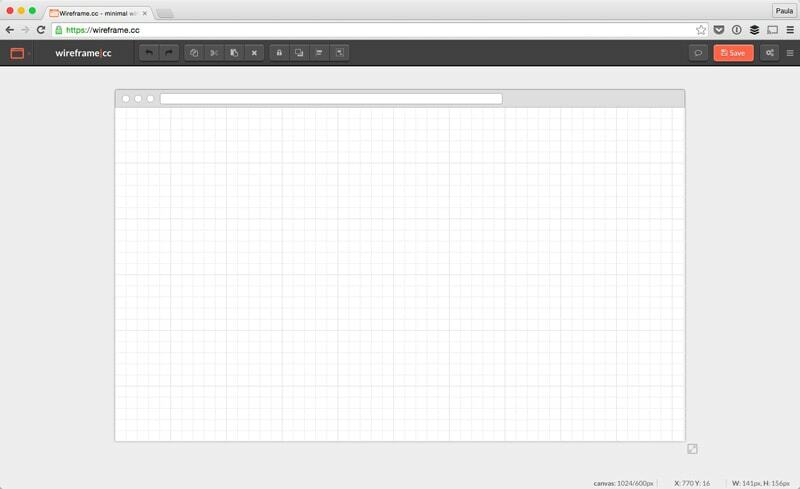 I don’t need an account to use wireframe.cc but, it is handy if I want to save my work. Since I don’t need an account, I can start using the app right away and it’s a pretty intuitive app. The onboarding experience here is pretty minimal but I do have everything I need in order to use this product. Do you really need their email? What about something more complicated? 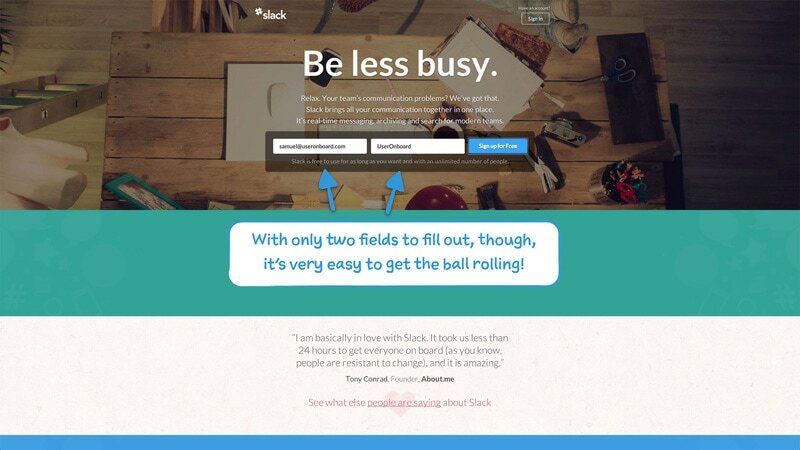 What about onboarding for an app like Slack? In order to use Slack, I do need an account. Therefore the onboarding starts on their home page. Again, in Slack’s example, they require the user to validate their email before you’re able to enter their messaging app. Although you are free to download and install it without validating the email first. Most apps do ask for email verifications and some block access at some point if a user does not do this. But not all of them. This is something to be mindful of all well. 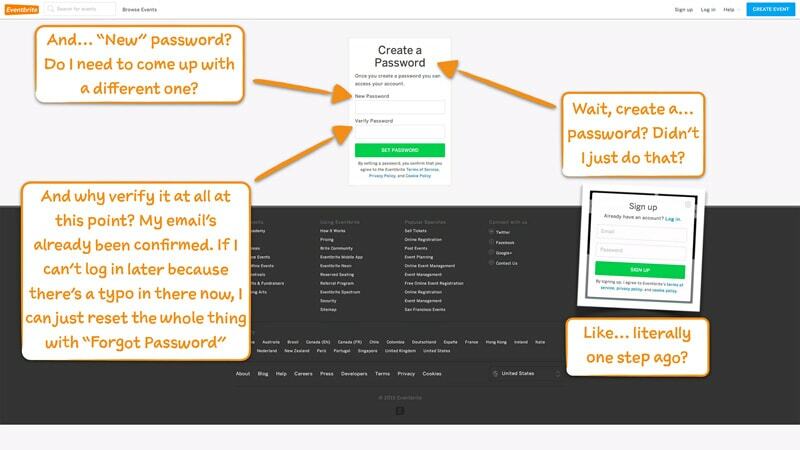 How crucial is an email verification in getting the user? Decide and incorporate accordingly. Here is another example of account creation from Eventbrite. First, you create an account by providing an email and password. Then you are asked to validate your email. (Sort of, you’re not actually asked, you’re not told what to do next but I digress.) When you click the link in the email to activate your account you’re taken to a page that tells you to create a new password. Think about that for a second. What a waste of time. What a great way to annoy the bejeezus out of someone. What an awful onboarding experience. Don’t ever do this to anyone! Does the user need a profile? As with most thing, the extent of a user’s profile varies from app to app. Some apps don’t have them and some require a memoir. Go figure. Only ask your new users the information that helps them be successful. In the below screenshot it may seem like Zendesk is not asking for a lot. After all, they only ask for a user’s name and a phone number which is optional. Yet, it doesn’t tell me why I, as a user, should provide either. Personally, I don’t like giving out my phone number to companies for two reasons. They never call me, so it’s a waste of my time to fill out, and I never know why they would need to call me anyways. Most companies communicate via email anyways. 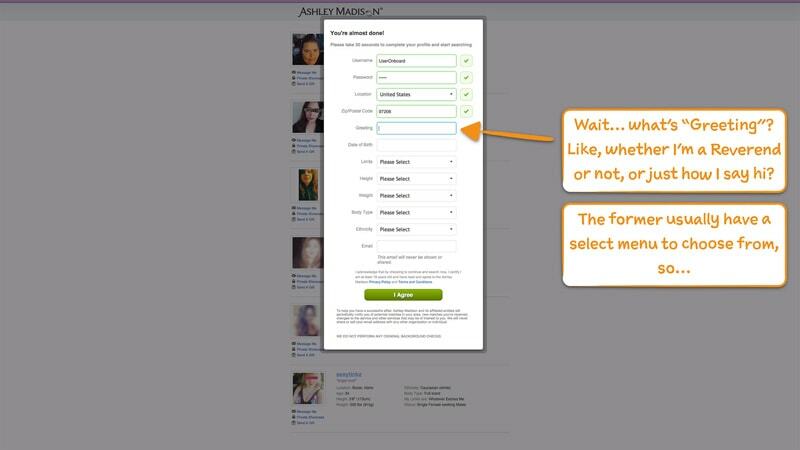 Here is an example from Ashley Madison. You need some information to be on an online dating – can you call Ashley Madison online dating since it’s for affairs? – in order to help facilitate better matching. That’s kind of obvious but, if you look at the form in the screenshot below some of those fields just plain don’t make sense. You want the profile creation to make sense. You need it to so that users fill it out correctly. This is just some good general advice but always indicate what the user needs to do next. We can debate button copy all day long if it should say “Continue” or “Next” or something more personable. However, that’s not the point. The point is when the button and action are missing it’s a really big problem. Check out the two screenshots below. A walkthrough could be a good intro to a very complicated product that cannot be redesigned. I am a firm believer that walkthroughs, and FAQs for that matter, are failures of the interface’s design. Anything design and product can be made intuitive. However, I do understand sometimes we can’t just spend an infinite amount of time redesigning and perfecting the product we are working with. An app like Optimizely can definitely use a walkthrough; it’s a complicated product to get the hang of so it’s a nice introduction to a brand new users. Like with everything, just make sure the walkthrough is too well thought out. My last piece of advice when creating an onboarding experience is to make sure it matches everything, you know, like the branding. Anywho, you want the whole first experience to feel smooth, cohesive and holistic. You want it to be as pleasant as possible. Having broken accessibility, like unclear UI labels, redundant tasks or different styling breaks this smoothness. Onboarding experiences can be a wonderful way to get a new user psyched about your app or product. It’s all about balancing usability and user experience but it’s not rocket science. Onboarding is supposed to get the necessary information they might need in order to effectively get started in using your product. Like I said, not rocket science! My overall advice is to think of onboarding all the whole process from signing up to using the product. It’s not the thing after a credit card is on file. It’s not the thing after a profile is filled out. And, above all, don’t ever let it be a walkthrough if you can help it! Paula is a freelance web designer who documents her travels with photos and words. She works with small companies that want to re-brand their online businesses to create products that change lives of their customers all in the hopes of gaining more customers and retaining their current ones longer. Excellent article that I was able to share with my non-designer coworkers re a website design we’re working on. Thanks!! P.S. A recommendation: Proofread– correct grammar helps the user experience too! This a great article pointing out some things I don’t normal consider in design. Next time I would split up the good from the bad more such as discuss good things to do, then what not to do, then show the best examples you have seen. Just some constructive criticism.